A New Look at the Speedball vs. Woodsball Debate! 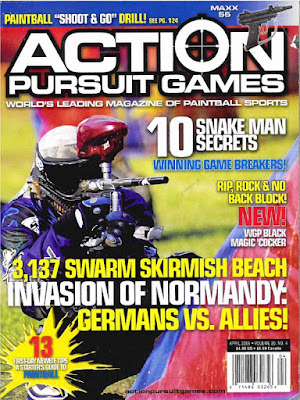 Within the paintball world the debate between speedball players and woodsball players over the virtues of their preferred type of play continues to burn. Both sides of the debate have become so entrenched in their beliefs that it seems this is a debate without resolution. 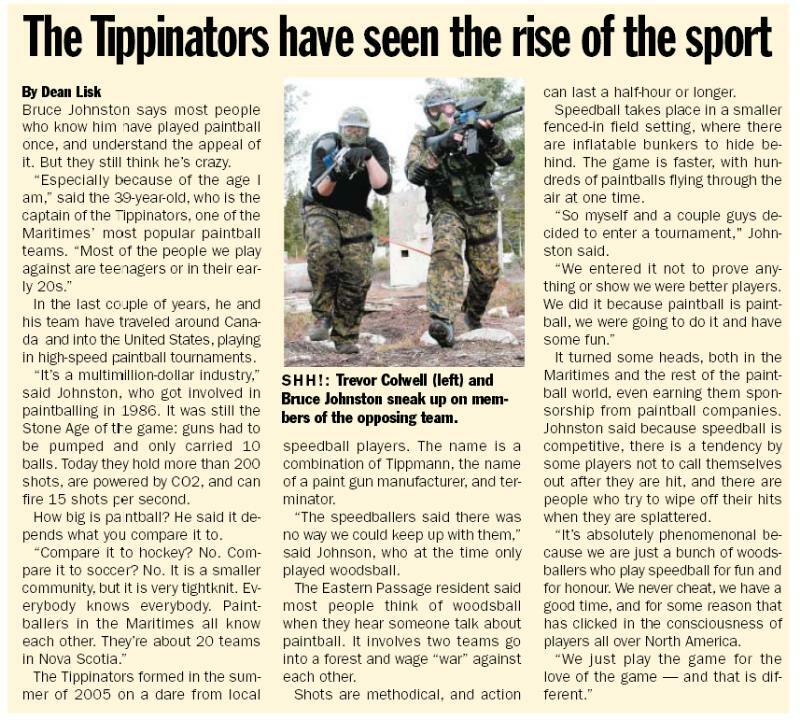 One paintball team, the Tippinators, playing from Mersey Road Paintball in picturesque Nova Scotia, Canada has a unique perspective on the game from both sides of the debate. The Tippinators made their first journey into international waters, competing in the Tippmann Three Man Challenge held at Skirmish USA, Jim Thorpe PA on August 20. The Tippinators entered two teams for the tournament and one was able to come away with a third place finish. The 32 hour round trip drive was worth every second for the great fun and fantastic learning experience. Alexander, Napoleon, Eisenhower, Rommel, Patton, Montgomery and MacArthur are some of the greatest generals and military tacticians in the history of the planet. What comes to mind when you think of these men? Courage, leadership, brilliance, resolve, paintball??? Tippinators competed in the Moncton stop of the "Golden Triangle (GT) 2006 Series" speedball tournament held at Atlantic Xtreme Paintball, Memramcook, New Brunswick on July 15th, 2006. The team managed another seventh place for a respectable middle of the pack finish for the mil sim airball team in their first interprovincial tournament and road trip in this the second of the Atlantic GT series. Unlike the cold rain endured at the Halifax GT the competitors in this tournament were pleased to finally play on a perfect day with sun and hot temperatures. Getting Your Paintball Team Sponsored! Top companies are offering sponsorships for scenario teams. How can you make your team stand out? 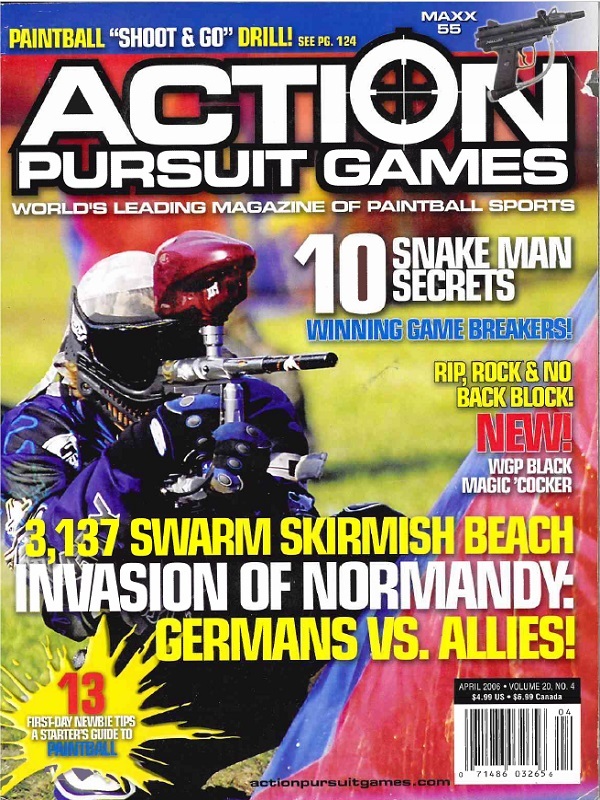 In recent paintball history, only high profile tournament speedball teams playing in organized leagues received sponsorship. 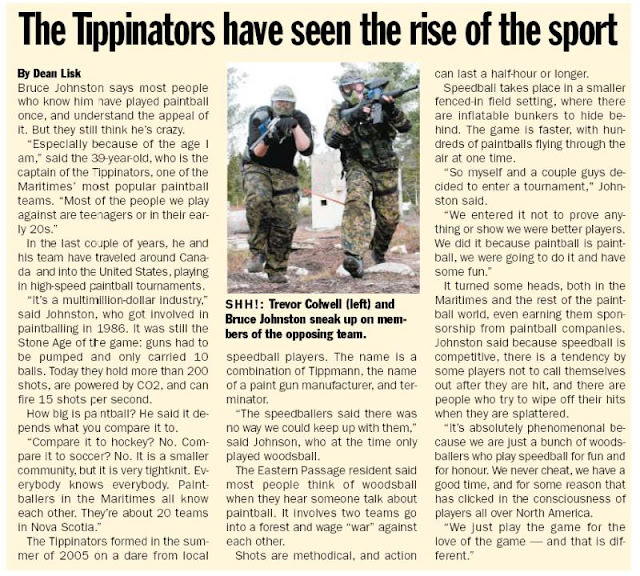 Today, with the increase in sales of woodsball products from companies like Tippmann Sports, the abundance of mil-sim style modifications for paintball markers (including the SP-8 and the Black Cell Ion), plus the advent of the Scenario Paintball Players League (SPPL) and increasing popularity of big games like Oklahoma D-Day (the world's largest paintball game) woodsball is coming back to the forefront of the sport. With this increased exposure comes an increased sponsorship opportunity for woodsball teams and players. Saturday July 1st was a perfect day for paintball at the Overkill Sportz three man exhibition speedball tournament held in Mount Uniacke, Nova Scotia. Sunny skies and warm breezes greeted the 10 teams who entered the tournament. The Tippinators made a strong showing by entering two teams for the event; Tippinators Grey Squad (Juno, Krush, Fireball) [pictured] and Tippinators Green Squad (Hired Gun, Jimbo, Charon, Fuzzy). Tippinators finish 7th in the Halifax stop of the "Golden Triangle (GT) 2006 Series" speedball tournament held at Overkill Sportz Mount Uniacke Nova Scotia on June 3rd, 2006. The GT is a nation wide series of speedball and scenario events that draws in the top players from every region. Tough competition and big prize money are the hallmarks of GT events. "Wow, they just mowed us down. There was nothing we could do. It was a slaughter." I wish I had a dollar for every time I have heard that statement or something similar coming from paint covered players in the neutral zone after a game. The truth of the matter is that yes they did mow you down but there is always something you can do. If you know the types of engagements that may occur on the paintball field while you are moving toward the opponent's base you will be able to overcome and dominate any situation. One evening in May 2006 while traveling some 1200 miles from home on business, I decided to pay a visit to a local paintball field. Niagara Tactical Adventure was a short drive from where I was staying in Niagara Falls and the field, within sight of the QEW, approximately half way between Hamilton and Niagara Falls in southern Ontario Canada, seemed like the great place to shoot some paint. I parked the car donned my Tippmann jersey (I never leave home without it) and went inside to find someone to play with. Tim Smith the friendly owner of Niagara Tactical welcomed me like I was one of his regular players. We hit it off right away and I decided to have a chat before hitting the field. "They had paint raining down on us from every direction. There was no way we could get anywhere near the flag." Does that sound familiar? It is fun to run around in the woods shooting paint but capturing the flag is the name of the game. I constantly hear people complain about how hard it is to attack the other team's base and capture the flag. Assaulting the flag might very well be the easiest part of a woodsball game, if it's done right. Unfortunately too many players and teams go about the assaulting the flag all wrong.